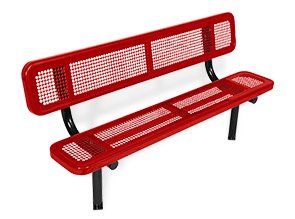 Keep it simple, this perforated steel park bench is a top seller. The wide appeal of the perforated metal style seat and back allow these 6', 8', 10' or 15' benches to add an inviting site aesthetic. The precision punched 5/8" diameter perforation is a captivating design, with no broad surfaces to retain water—allows the benches to air-dry fast or quickly be wiped down. These popular benches feature smooth rounded edges—increasing their comfort and safety. 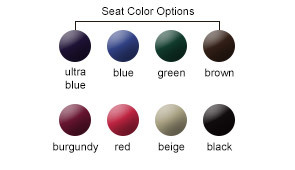 The seats and backs are finished with a durable polyethylene coating with the frames that are sealed in trusted powder-coated finish, this bench will maintain its smart look for many years to come. These perforated steel benches are available in portable, in-ground, surface and wall mounted models. Customize with a message and/or logo. Find more detailed information and place an order here.